Boom Bat Gesture Performance Group had been around since 2012 and they have recently created Blankland presented by The Exponential Festival. 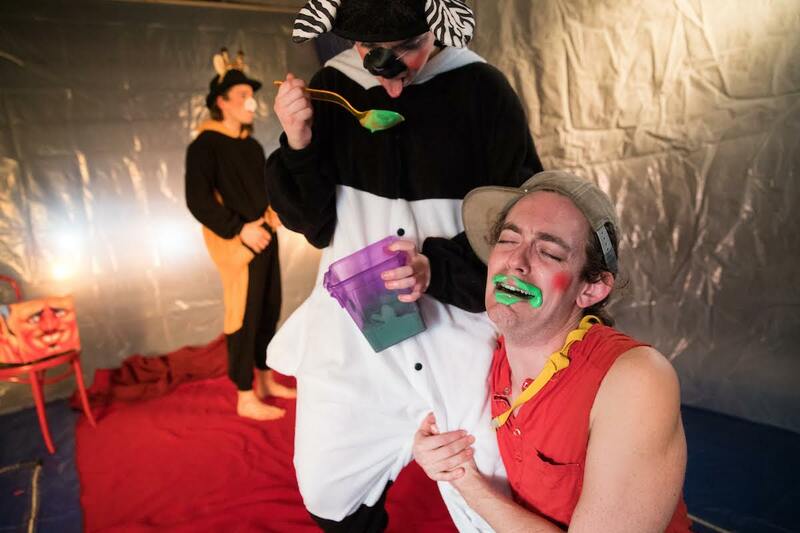 Blankland is a multi-experimental theater piece that will make you laugh and feel slightly uncomfortable throughout. It will get you out of your comfort zone and into Blankland with characters you never wanted to meet. The show begins when you enter the space. You walk down a creepy stairwell into a basement that is covered head to toe in thick plastic. Basically if a murderer could ask for the best place to kill someone and get away with it, it would be in this space. Due to that fact, you are physically and mentally on guard, which is the point. The next thing that happens is that you are handed a green pudding–like substance. That is all that needs to be said about that. As the story begins, the lights dim out and two screens come on with a voiceover of a child going to bed. The premise is that the child is afraid to go to bed so they turn on his favorite show, Blankland. This is the world in which we are pushed into with inherently creepy characters and story lines. It is definitely a darker and weirder "Death to Smoochie" type of story, but again much stranger. The characters, played by Jon Burklund, Edward Rice, Ilana Stuelpner, and Niko Tsocanos, were all fully committed and took on multiple rolls during this process. Ilana, Jon, and Niko were all also the directors. It was good to see that there were multiple directors because each scene was so specific to what the performer’s physical constraints were. This show was extremely physical and messy. It is important to always make your performer feel comfortable, but in these cases the directors were also the performers. As stated, the show is messy. The audience wears a tarp the whole time and rightly so. On this note, not all of the mess was necessary. There were moments when the messy touching, spitting, and other actions were just too far. Most of this show was about shock value, at moments it worked and at moments you were so creeped out or grossed out you did not care about the performance. The best part of Blankland was the actual experience that the audience had together. It brought everyone together because you almost needed your seat partner to talk with so you could get through it all! There was a camaraderie that was created and was the most meaningful part of the show. Blankland is not for everyone and that is ok. You must love performance art and obscure theater to find an appreciation for this piece, there is beauty in everything. Blankland was definitely out of most people’s comfort zones, but Boom Bat Gesture Performance Group should be commended for their continued originality and commitment to performance theater.